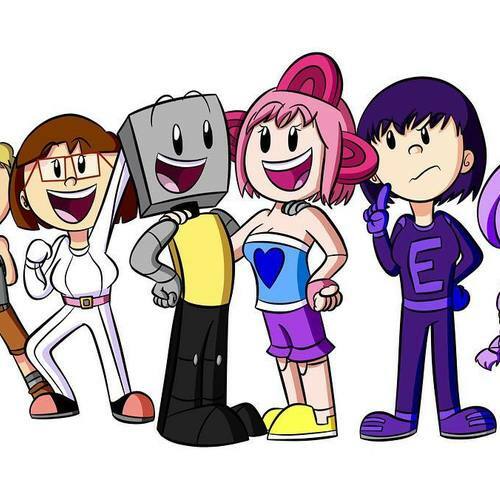 Sometimes I will make some GameBot 2000 contents that I can come up with myself, and can be referencing some games, TV shows, movies, YouTube stars, etc., and I am and will try my best to entertain you and make you laugh, even though I can't think of anything funny much, I might get some ideas from some of my friends I know personally. Anyway, what I think is more interesting than just comics are comic dubs! If I'm going to make some comic dubs and some other content, I might need some voice actors to help me make them possible, if ya know what I mean. Information about my characters: List 1, List 2, Angelica's, Mayako's. Her voice sounds like an adorable young teenager(even though she is a teen) from high school: Click here! "Hello! My name's Ky Ethans, a fun and adventurous teenager that can go on any journey!" "I hang out with my best robot friend, GameBot 2000!" "I've been doing a LOT of exercise lately, and that means I'm the most flexible girl ever, but I'm not as strong as GameBot though." "I run as fast as GameBot, and... yeah, I'm just speedy." "I even play video games, especially with GameBot, but most of the time I'm more of a PC gamer, and I play games like Portal, A Story About My Uncle, ect." "I get scared easily, so please don't pull any horror-themed pranks on me, please." "How do you like my suit? Looks adorable on me, doesn't it?" "I am also a very good singer! You should hear me sing Build our Machine!" "Well, I have to go now. if you wanna know more about me, there's a plan for a GameBot game to be made in the future, and I'm sure that it'll be a good indie game. Alright, bye now! Wink wink!" So, GameBot. You like it when I belly dance, right? Heck, I've been doing that for years! She has some roughness and aggressiveness in her voice, like Undyne: Click here! "Greetings. The name's Elena Constance. I'm a purple-spandex-outfit-wearing, awesome, laser gun wielding, determined teenage former villain of the GameBot series." "In case you don't understand, according to the story of the upcoming GameBot video game, I am the antagonist, but NOT the main antagonist, because later in the game, I have reformed into a good person. You'll know about this in the future, believe me, I'm not going to tell you more things about the game. I also have my own biography, but I dunno if GameBot is either going to show it off soon, or save it until the game is completed. We'll see." "My favorite insult is, 'You spastic idiot.' I will be saying that sometimes in the series." "You may think that this purple outfit with my initial on it is a whole suit, but you're wrong. It does act as if it is a whole suit, though, if ya know what I mean." "Sometimes I can get aggressive, especially when Zach's nonsense annoys me, and that makes me hit him sometimes, but he, GameBot and Ky knows that I don't mean it." "I am the most determined, bravest, strongest, and the most skilled gunner on Earth." "My favorite music genres are rock and roll, metal, rap, and pop." "Anyway, I have to run off now. If more of my information is needed, look forward to a GameBot game that is planned to be made in the future. Peace out." His voice sounds like a 14-year-old from Stranger Things(get the hint? ): Click here! "Yo! What up! I'm Zach Davis!" "I, uh... I'm wearing a 1-UP t-shirt! Cool, right?" "Darn, I dunno what else... Maybe I should talk more about myself. Yeah, let's get to that. Alright. (clears throat)"
"I am just as fun as GameBot because I play a lot of video games with him too! Except for bootlegs, like Somari." "Sometimes I love to have some headphones around my neck as a accessory. You won't see me do that much in the GameBot series, though." "There are some moments where I do something ridiculous and silly that can make people laugh, I might accidentally annoy Elena and she'll hurt me to stop what I'm doing. Let's not talk about that again." "This may seem weird to you because of they way I look. but I'm the strength type character, so that means I'm a little stronger than GameBot, like Knuckles, Donkey Kong, and others! ...except that I'm not as speedy as GameBot." "And, uuhh... Ugh, ok, y'know what? I kinda ran out of what I'm going to say right now, so I think you'll learn more about me in the upcoming GameBot indie video game in the future. Alrighty. Ta ta!" You spastic idiot! I've been trying to work on this here machine for months! ♪ Is it because I can't be her? Katherine 2.0.5 is the name. GameBot is not the only adventurous robot in the city we all live in. Unlike him, I'm more of an anti-hero, if you couldn't tell. I get into argumentative fights with Elena sometimes, but... yeah, nothing to say here. I do things on my own, but when you're really in some kind of peril, I might help you and get it over with. I have the same fighting moves as GameBot, strangely, and I don't know why. If you think that I may seem edgy, it's because I AM edgy. And sometimes savage. I may leave now. I will star in Story 2, you'll know what that is soon, of the indie game, GameBot 2000: The Video Game, where you'll learn more about me and my personality. BOO! Hi, I'm Hallowgirl! I'm the spookiest, energetic, and the most funnest person ever born in Halloween! I am a candy addict, so you'll be seeing me eat SO MUCH CANDY!!! But I wanted to stay in shape though. That's where they invented some healthy and diet candy. Bleugh! It was worth eating them though. I may seem like a sweet, innocent girl, but I can make some scary faces! But for some reason, people are saying that my scary face looks so... demonic. I dunno what my scary face looks like, so I am so confused. Here's the most epic thing you'll ever hear! You see, there is some special legendary candy that can only be used by me, and why I eat that candy, I can transform into a hulk-like monstrosity! It only lasts for an hour though. GameBot's mah buddeh! I hang out with him sometimes! Just thought I'd say that right now. I may act like a brat sometimes. I know it seems weird and immature because I'm 13, but no matter. Huh, wazzat? Aw, I have to go now! But no worries, you'll see me again in the GameBot comics, and the upcoming soon-to-be-made GameBot video game! Alrighty, bub-bye! Whoosh! She is a short 13-year-old. You can see her information here. Think of any voice that fits her, but remember her age shown in this description. Hey there. ...sorry, I'm a little shy. My name is Angelica Grant, but you may call me Angelica. I'm one of the GameBot characters that appears in Story 2 of GameBot 2000: The Video Game. More information will come soon about stories like that later. I may be less tall than GameBot and his friends, but I am not 11 or 12, I'm actually 13. Don't judge me by the way I look. Speaking of looks, you may have noticed that my hair covers my right eye, kinda like Rosalina from Mario Galaxy. I can still see through my hair though. My favorite season is summer, because school is a complete waste of my time and I hate dark evenings. If you are looking for a way to deal with enemies that are too difficult for you to fight and stronger than you, then I'm your girl. Come talk to me and I'll help you out with that particular problem. I know what to do. Alright, I'm leaving right now. The future soon-to-be-made GameBot indie video game will give you more info about myself. Take care! Also, DON'T call me cute, and I MEAN IT.